I’m lucky enough to live in the beautiful state of Vermont. Almost every day I come across a beautiful scene of some sort. I’m constantly reminded beauty is all around us, and it inspires me to continue to seek beauty in my everyday life. One of my areas of focus is my personal care products. I’ve partnered with Beautycounter as an educator and consultant because I’m horrified at the sheer number of untested and potentially unsafe chemicals we put on and in our bodies and the bodies of our families every day. I was lucky enough to see the beautiful sunset featured above the other day and it hit me- not only do our personal care and cosmetic products end up disrupting our endocrine systems, but they also end up in our water system. Any time we wash our face, wash our bodies or wash our clothes, the chemicals that weren’t absorbed wash down the drain and into the water table. Those that we do absorb that are flushed by our kidneys end up flushed by our toilets. All this junk that we’ve exposed ourselves and our families to is now in our drinking water, our lakes, rivers and oceans and affecting the wildlife and aquatic life around the world. We’ve all seen the horrible image of the bird full of plastic in it’s rotting body, but what you can’t see is all the preservatives and carcinogenic chemicals it likely ingested. Not only should we be making the #switchtosafer for ourselves, but also the planet. Our choices have larger implications than just our immediate health. 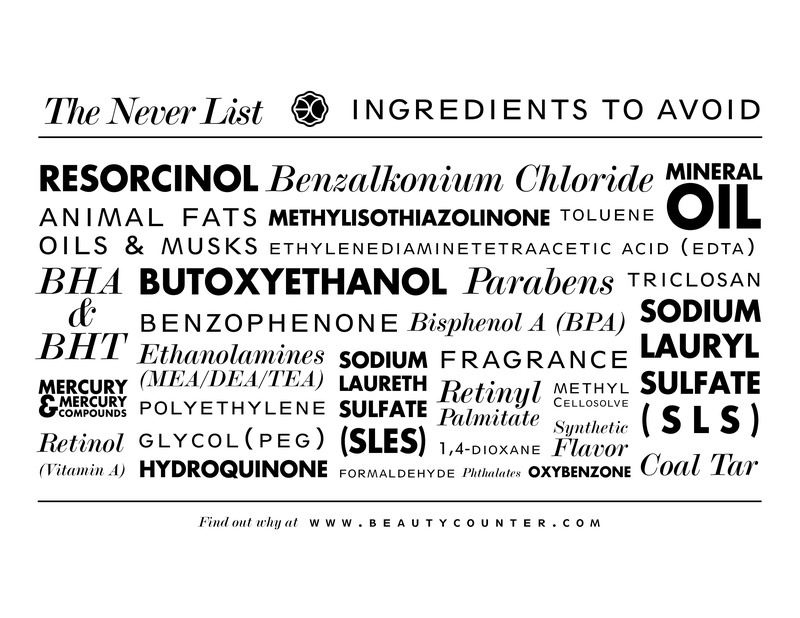 Beautycounter and their Never List are doing their part to reduce the chemical load on our bodies and the planet. That’s a win all around.